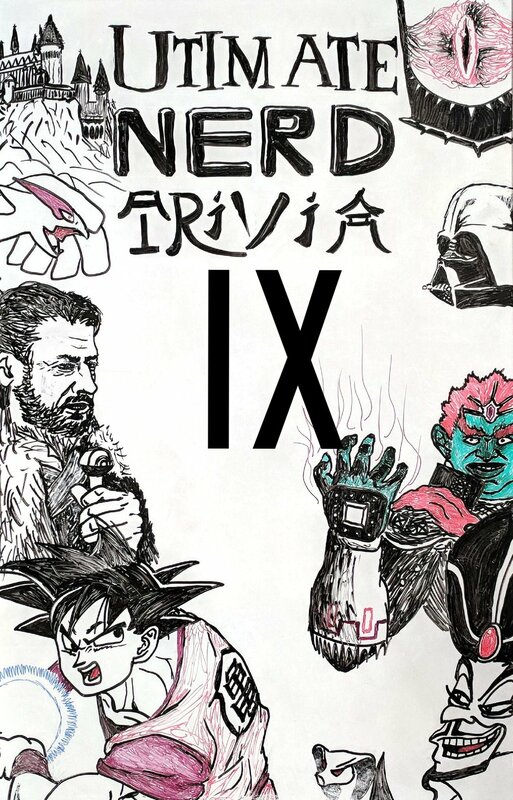 Nerdy Trivia IX - It's Back!!! Welcome to Ultimate Nerd Trivia, where your skills will be put to the test as you embark on a journey through the multiverse! Meditate on the Force and be prepared to summon patronuses against other teams competing for treasure worthy of Captain Jack Sparrow. Nerdy costumes and witty team names will earn your team valuable bonus experience points, which could give you the edge you need to best the previous champions. A simple levy of two gold doubloons ($2) will grant one able body entry, or perhaps enlist friends to your cause and enter your team for one dime-ond ($10) [ouch-hahaha]. May the odds be ever in your favor. Every purchase you make at Brew Coffee Spot helps them continue providing a space for this wonderful event :) Thank you for your continued support. Each category will have three questions of varying difficulty. Challenging questions earn more XP (experience points) if answered correctly, with many questions having bonus XP available. Max team size is 10, and smaller teams (only 1, 2, or 3 members) will receive a small XP bonus at the end to incentivize everyone to play. Each team will receive a sheet of paper to document their XP, answers, notes, and doodles. Trivia will commence at 6pm, so gather your team ahead of time to get situated with your delicious latte or pastry.